Thanks to Klavan on the Culture for this screen grab. Good news, beheaded Christians. Terrorism is not an existential threat. The President of the United States himself has told us so. He says the threat from make-believe climate change is much worse than the threat from actual world-wide Islamic jihad. That is probably why he was taking funny-face selfies while ISIS zanies were cutting off the heads of 21 of you in Libya, because you having your head cut off doesn’t make the climate any warmer (or colder or whatever it is supposed to be getting). So it’s not an existential threat (except, you know, to you). Isn’t that great? Oh, and by the way, you may have noticed that the White House didn’t mention the words “Islamic” or “Christian” when it issued its statement about your whole unfortunate “head-off” incident. And you might say, “Hey, why not? That’s why we were killed. Our murderers decapitated us in the name of Allah because we followed what they called ‘the illusion of the cross. '” But no, no, no, no, no — that’s just the kind of muddy thinking you do when… you have no head. See, super-smart President Obama explains that “no religion is responsible for terrorism.” I’ll bet that’s a relief to you, right? Those terrorists who killed you only thought they were acting for religious reasons. Silly guys! I guess they were just clinging to their Korans and their scimitars! And listen, just because you were killed in the name of a militaristic and oppressive Allah for worshiping a Christ of love and freedom, that doesn’t mean you can get on your high horse… After all, as Obama pointed out, some people did bad things of some sort in the name of Christ, like, a thousand years ago… so really, you kind of got what you deserved, didn’t you? Just try to keep that thought in your head. Sorry… maybe that was insensitive. Oh, and hey, there’s some good news for dead Jews too! I know Islamists have been gunning you down and defacing your places of worship, and harassing and bullying and terrorizing you on the streets of once civilized Europeans cities. And maybe you’ve been thinking: “Whoa! 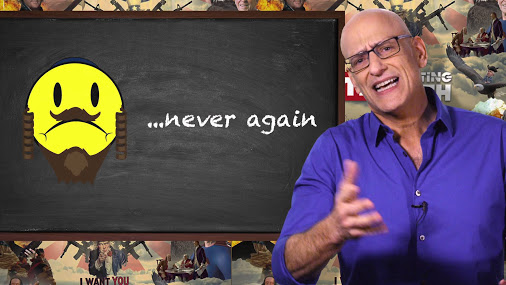 Whatever happened to ‘Never Again.’” Well, about that whole “Never Again” thing. Remember “Hope and Change?” That’s what changed. See, you might think that militant Islam’s relentless assault against the Jews, and the left’s tacit support of that assault in their vicious and mindless campaign against Israel’s existence, are just part and parcel of Evil’s millennia long war against the people of the Bible. But great news: it’s not that at all. In his response to the Islamist slaughter of four people in a kosher supermarket in Paris, Obama said the victims were just “random folks,” …killed randomly by other random folks randomly killing random folks randomly. So Jews, you don’t have a thing to worry about. Isn’t that terrific? You see, all you people being killed by ISIS, Al Qaeda, the Taliban, Boko Haram, Al-Shabaab and other Islamist groups around the world… oh, and all you women being unspeakably brutalized by them… you’re lucky our president Barack Obama is wise enough not to do anything at all to help you because he understands that the terrorists are on the wrong side of history. So all he has to do is sit there on the right side of history. Being right. While you suffer and die. Isn’t that good news?